Strictly speaking, the answer is no. The developer cannot prevent the user from choosing files of any type or extension in the native OS file select dialog box. should provide a way to filter out files other than .xls or .xlsx. Although the MDN page for input element always said that it supports this, to my surprise, this didn't work for me in Firefox until version 42. This works in IE 10+, Edge, and Chrome. JSFiddle of the same: here. Here are three good reads on file-uploads and security. There is the accept attribute for the input tag. However, it is not reliable in any way. Browsers most likely treat it as a "suggestion", meaning the user will, depending on the file manager as well, have a pre-selection that only displays the desired types. They can still choose "all files" and upload any file they want. Keep in mind that it is only to be used as a "help" for the user to find the right files. every user can send any request he/she wants to your server. you always have to validated everything server-side. So the answer is: no you cannot restrict, but you can set a pre-selection but you cannot rely on it. You can use the change event to monitor what the user selects and notify them at that point that the file is not acceptable. It does not limit the actual list of files displayed, but it is the closest you can do client-side, besides the poorly supported accept attribute. Yes, you are right. It's impossible with HTML. User will be able to pick whatever file he/she wants. Technically you can specify the accept attribute (alternative in html5) on the input element, but it's not properly supported. To select only image files, you can use this accept="image/*"
I know this is a bit late. Look at this basic tut if you would like to get started with server side validation. For the whole tutorial visit this page. As mentioned in previous answers we cannot restrict user to select files for only given file formats. But it's really handy to use the accept tag on file attribute in html. As for validation, we have to do it at the server side. We can also do it at client side in js but its not a foolproof solution. We must validate at server side. For these requirements I really prefer struts2 Java web application development framework. With its built-in file upload feature, uploading files to struts2 based web apps is a piece of cake. Just mention the file formats that we would like to accept in our application and all the rest is taken care of by the core of framework itself. You can check it out at struts official site. Not the answer you're looking for? Browse other questions tagged html file types or ask your own question. how to force the browser to list only .xml and .txt files in open dialog? input type file, select only .css and font files? 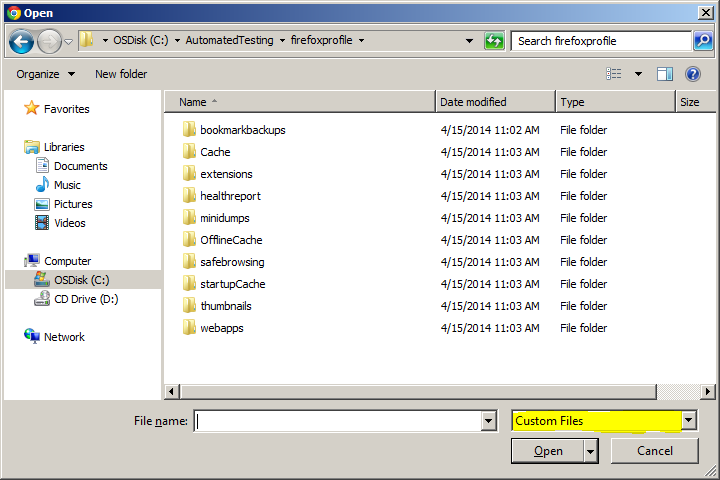 Image format dropdown when using <input type=“file”>?